The Best in Gulf Shores Vacation Rentals! Discover why so many vacation traditions have started on the beautiful beaches of Gulf Shores and Orange Beach Alabama. A huge selection of gorgeous Gulf Shores vacation rentals with year-round availability is just the beginning! Breathtaking sugar-white sand, sparkling emerald green water, a large variety of fine seafood and traditional restaurants, championship golf courses, fishing charters, exciting nightlife and plenty of water and amusement parks all help add to the creation of an unforgettable vacation experience. Plan a beach vacation or quick getaway to the Gulf Shores area with your family, friends, church group, sports team or business and make memories to last a lifetime. Once you’ve booked your Gulf Shores vacation rentals, it’s time to plan the fun! There is something for everyone; school groups and history buffs will discover fascinating civil war history at Fort Morgan, Alabama, and nearby Fort Gaines on Dauphin Island. The outdoors and sports-minded vacationer will enjoy inland and deep sea fishing, national and regional sporting events and daring personal watercraft excursions. Young’s Suncoast Realty and Vacation Rentals offers a wide variety of vacation properties throughout the area. From large beach homes that accommodate many, to beachfront condos with heated pools, Young’s has you covered! Our Gulf Shores vacation rentals include small 1 bedroom units all the way up to large 8+ bedroom beach houses. Let us help you find that perfect Gulf Coast rental with the added benefit of our exceptional guest service. 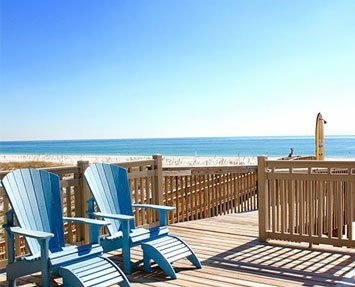 A very popular means for vacationing along the beach, our Orange Beach and Gulf Shores beach house rentals are full of amenities and well located throughout all the local beach communities along the Alabama Gulf Coast. If you are traveling with a large group or are planning a family reunion, we offer many homes in close proximity that can be rented together. Search our listings and if you can’t find your dream vacation home, contact us, we are happy to help! Our vacation team will go above and beyond to help you find the perfect Gulf Shores vacation rentals for your entire group. Have you ever rented a condo for your vacation? We highly recommend that you consider it. Condos are a great, often very affordable way to vacation with all the amenities of a resort hotel, but more space and flexibility for our guests. We offer a surprising range of Gulf Shores and Orange Beach condo rentals near the beach and popular attractions and within a variety of budget ranges. Check out our available condo rentals today! No matter your specific Gulf Shores vacation rentals needs, Young’s Suncoast has you covered! With hundreds of properties dotting the Alabama Gulf Coast, we are sure to have the perfect option for your next trip. Contact us today for assistance with your specific needs. From cozy 1 bedroom options to beautiful beachfront homes, from pet-friendly units to luxury wedding homes, we have you covered! Check out all of these fantastic Gulf Shores vacation rentals for your coastal vacation. View our Gulf Shores and Orange Beach complexes side by side, and discover which properties are perfect for your beach getaway. We have a variety of Gulf Coast lodging deals & specials to help you save on your vacation. Check them out before booking your Gulf Shore vacation rentals online! If your beach vacation calls for adventure, excitement, quiet relaxation or all of the above, then a Gulf Shores vacation will win your heart and keep you coming back for more! We have a child with special needs that requires wheelchair access and a hospital bed to sleep in. Young’s SunCoast worked with us to find the right condo on the beach that could accommodate our family. She found an owner that would allow us to bring in a rental bed and measured all door frames to ensure our son had access to all rooms. Everything was arranged in advance and was spot on when we arrived. Our stay was great! This was our group’s first time in Gulf Shores, and we thoroughly enjoyed ourselves. We will be back and will most definitely be renting through Young’s Suncoast again! Excellent Service! Thank you. Anytime we come to the beach, we use Young’s Suncoast and we’ve always had great experiences! When we arrived to Gulf Shores we learned we were double booked through another company. We didn’t know what to do. Luckily, Young’s Suncoast stepped in and they were quick to find us a much nicer condo at the same cost. They provided us with Great Service that saved the day and our vacation! They just earned our loyalty and repeat business. We recommend Young’s Suncoast to everyone. We had a wonderful week in a Summer Chase condo. The Youngs’ staff were very professional and caring. I have worked with Young’s Suncoast for the past 5 years in bringing several young adults with me each year. Each of the condos at the San Carlos Condominiums were very nice. I was greeted with efficiency at the office and a friendly staff. Upon our leaving, it was very easy to check out, and we once again found the staff to be courteous. We have booked our vacations through Young’s for the past 3 years, now 4 at the recommendation of friends! They offer the best terms and rates. Love that you can reserve a vacation for only $89. Easy check in and check out. Thank you Young’s for your wonderful and friendly staff!